Pissouri is a picturesque village located in the Limassol district, Cyprus (thirty kilometres westwards of Limassol’s centre), between Limassol and Pafos with a total permanent population is said to reach around 2200 people, about 2/3 of them are Cypriots, the rest foreigners, mainly British. One rumour states that it took its name from the ancient city "Voosoura" mentioned by the ancient historian Strabo which was located in the surroundings of the Pissouri area. Another rumour relates the name of the village with events that happened during very dark nights (In the Cypriot dialect the word "Pissouri" means "very dark"). 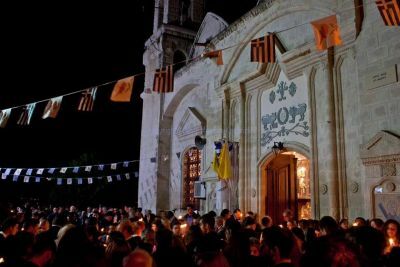 One tradition says that the 300 "Alamanoi" saints who came to Cyprus from Palestine to hermitage in various parts of the island, arrived at the bay of Pissouri during such dark night. Another tradition mentions that the escape of the Holy Fathers who were persecuted during the early Christian years, was made through a dark area at night. Eventually it is believed that the interpretation of the name of the village is simpler. At some point in time, resin was being produced in the region and thus the village got its name. Resin from pitch pine must have been produced in the region during the Byzantine period and during the Frankish period. 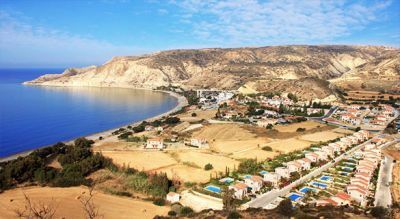 Pissouri receives an annual rainfall amounts of 447 mm. The main production is the variety of "Sultanina" grapes produced mainly in the enchanting valley that stretches to the Pissouri Bay. Also cultivated olive, carob and almond trees are grown.